Recently, I've discovered that I enjoy showering during the day verses showering at night. The main reason for my new fond enjoyment is that the scent of my hair seems to linger longer than when I shower at night. How is this possible? I'm assuming that since I decided to blow dry my that the heat sinks the products into my hair, thus it smells awesome all day. Honestly I have no other conclusion. When I shower at night and wake up my hair does smell as it did when I washed it, however the scent does not linger as long as I want it to. Now that I've been blow drying my hair 2-3 times a week, I discovered a product that keeps it from looking frizzy while still protecting it from the heat induced by my blow drier. I usually hate looking for hair products that do their job simply because most times they have failed me, but not this one! 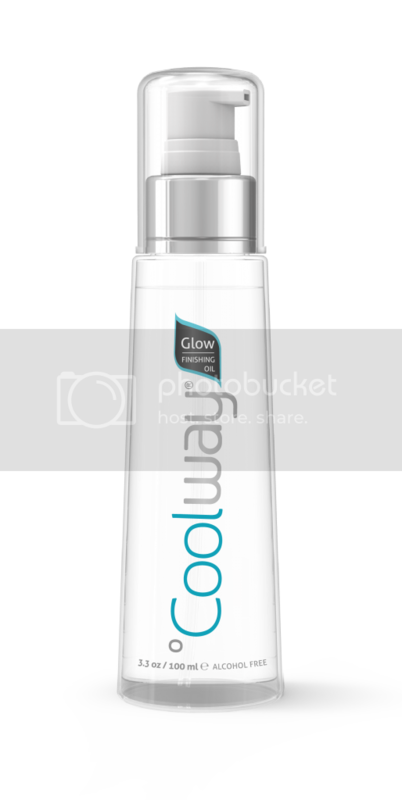 My secret to my blow out hair minus the tremendous damage is the Coolway Glow Finishing Oil. On the Coolway website, it shows that is product has been featured in multiple magazines and won awards from Allure and OK! magazines. However, awards as such does not convince me that the product works until I actually used it. I received this in my BoxyCharm a couple months ago and honestly thought it was 'just another hair serum' like I usually do. To make a long story short, I went on a jog and came back in to shower. Then I lost track of time and my hair was soaking wet. So I reached for my blow dryer and my heat protectant spray except it was empty. I found the serum setting my drawer of unused beauty products and gave it chance. Luckily the product worked, very well I might add. Packaging: It's a capped bottle with a pump that pushes the serum outward. My only concern with the container is that the cap that goes over the pump is made of a terrible plastic. I dropped the bottle once and cap faced death on impact basically. It has a decent size tube inside that manages to get all of the product out from the bottom. Amount of product for the price, 3.3oz / 100ml. Price & Product Location: This product retails for $29.95 on it's website and priced a little less on eBay from various members. I've been using the product since April and 85% of it still remains in the bottle. I would say the product will last me maybe 8 months since I only blow dry my hair 2-3 times a week on average. After calculating the amounts of usage, I would say the product is priced fair. Ask for item location, I can only find it online so it makes the item not as assessable but still you can manage to purchase it. Product Overall: I used one & half pumps and I rub in damp hair before using my blow dryer. 80% of the frizz is non existent. My hair is smooth and soft to the touch. Overall happy with this product. The scent is not bad either, it smells like christmas time. For the amount of usage I can get out of it, the price is fair. Repurchase? When it comes to products, I'm definitely one to explore new items at the store. However if I do not find one that works as well as the Coolway, then I might consider buying it. I featured this product in a recent hair tutorial (located above) if you would like to see it in action.